Primary vertebral body tumours constitute only about 5% of skeletal tumours. Their morbidity is high due to instability and neurological deficits related to the spine. The complex anatomy further highlights the expertise needed in their management. A multidisciplinary management has heralded tremendous improvements in the treatment of primary vertebral body tumours. From incomplete resection with a high recurrence of these tumours in the early 20th century, to the present day complete en-bloc excision of the tumours, guided by the well-established staging and classification systems, have been the significant changes brought about in the long course of treatment of these complex tumours. The overall results are better with radical excision in combination with adjuvant therapies. 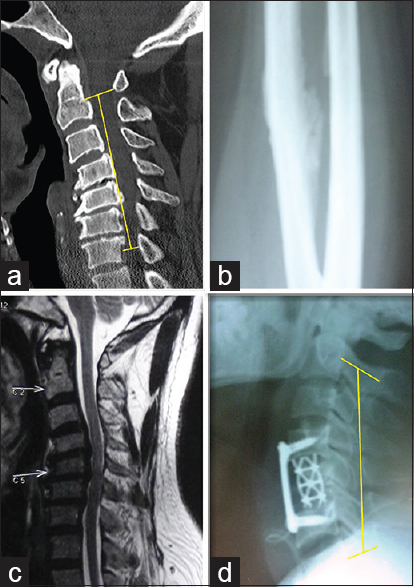 Complex and previously unimaginable surgical techniques are accomplished easily with a multi-disciplinary approach and with newer spinal instrumentation. Understanding of the evolution of surgical techniques and the prevalent classifications are essential in the surgical management of vertebral body tumours. A paradigm shift in human evolution, from our predecessors, the ‘hunter-gatherers' to the ‘era of digital revolution’, has made certain human skills more and more machine driven. This digital revolution has made possible a constant connectivity, wearable technologies, customized platforms, enormous data storage and cloud computing at high speeds, smart phones and apps, internet of things, artificial intelligence, telemedicine, etc. 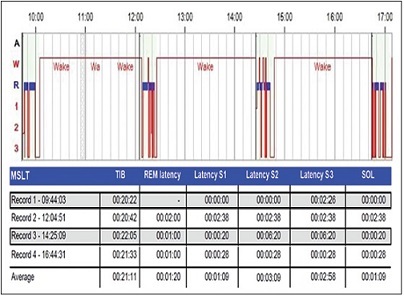 These have made real-time monitoring and interventions possible in healthcare. Most advanced countries have made electronic health records (EHR) mandatory. The Government of India has an agenda of Digital India and digital healthcare and might insist on EHRs. EHR is a real-time, patient-centered digital version of a patient's paper record/chart, available instantly and securely to authorized users. EHR contains a patient's medical history, diagnosis, medications, treatment plans, immunization dates, allergies, radiological images, and laboratory results. It can access evidence-based tools that help to make safer decisions about a patient's care with enhanced decision support, clinical alerts, reminders and medical information. The procedure is also more reliable for dispensing medications and introduces the convenience of e-prescriptions. While the advanced technology and digital devices are well received by the healthcare providers, universal acceptance of the EHRs is far from achieving its full potential. The author, in this paper, discusses the current scenario and issues concerned with EHRs in the digital healthcare. Duchenne muscular dystrophy (DMD) is an X-linked recessive disorder. It is still an incurable disease and many clinical trials are going on to find the cure for this disease. There is a need for sensitive and reliable measures for detecting the disease progression. This manuscript focuses on reviewing the different outcome measures which can be used in the Indian DMD patients. 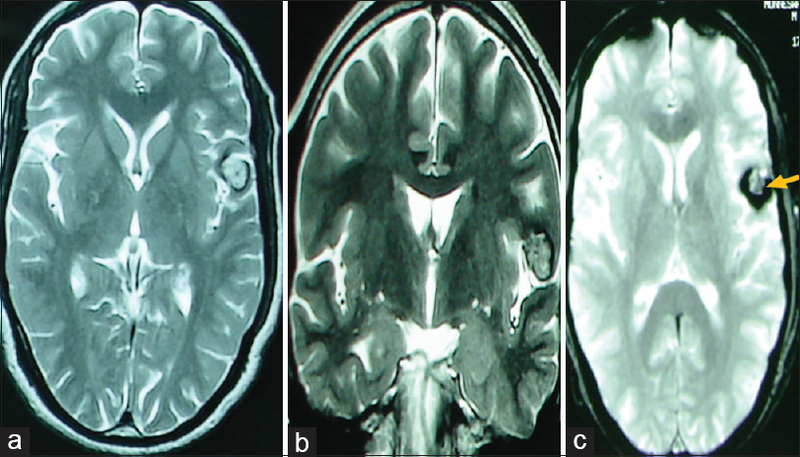 Posterior reversible encephalopathy syndrome is characterized by acute headache, visual impairment, seizures, and altered mental status; neuroimaging may show cerebral edema affecting the parietal and occipital lobes of the brain. 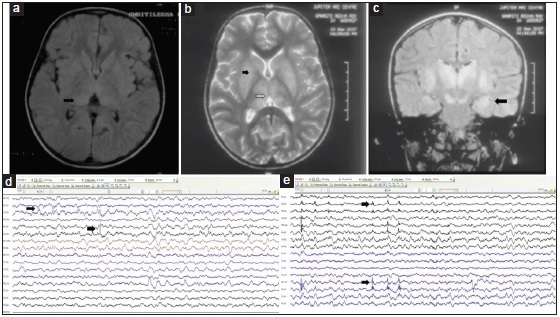 The objective of this article is to review the current understanding of posterior reversible encephalopathy syndrome in eclampsia. Literature was searched from PubMed, Scopus, and Google Scholar databases. The search terms included “eclampsia”, “eclampsia and posterior reversible encephalopathy syndrome”, and “pregnancy and posterior reversible encephalopathy syndrome”. We reviewed all published original articles with the search term “posterior reversible encephalopathy syndrome”. 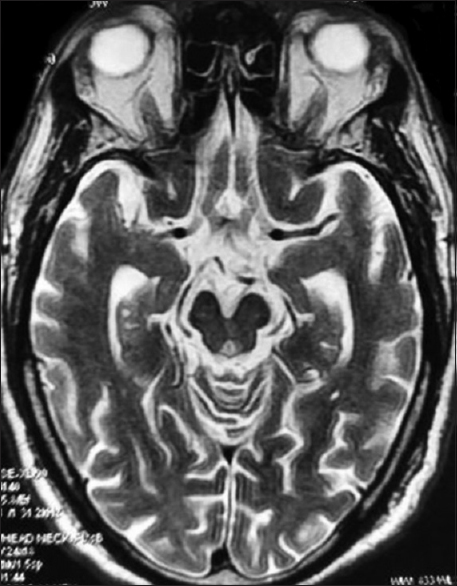 Up to 100% of eclamptic patients may have reversible posterior leukoencephalopathy syndrome. Two putative mechanisms – “vasogenic” and “vasospasm” – are considered to be responsible. 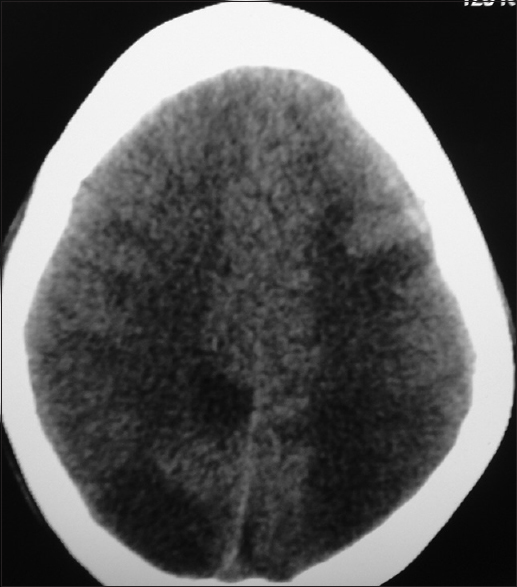 Cerebral edema and petechial cortical hemorrhages are common autopsy findings. 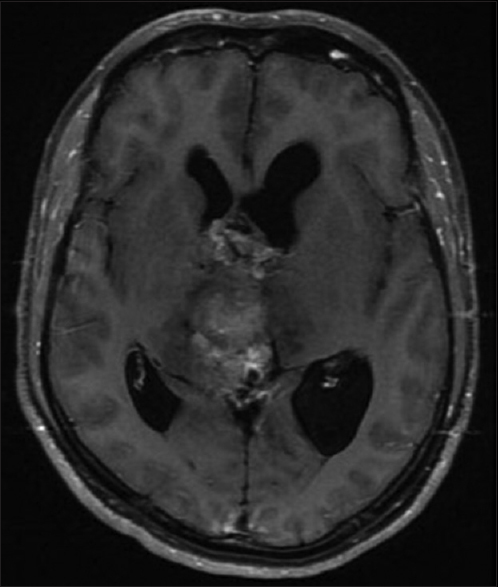 Clinical and neuroimaging manifestations are reversible in the majority of patients. Prompt correction of increased blood pressure and treatment of seizures are the cornerstones of treatment. Magnesium sulfate is the drug of choice for seizures. Some survivors may have permanent vision loss and other disabling sequelae. In conclusion, posterior reversible encephalopathy is a devastating complication of eclampsia. Early recognition helps in preventing some of its devastating sequelae. Background: The objective of this article was to study the presence of antibodies against Zika virus (ZIKV), Campylobacter jejuni, and gangliosides in patients with Guillain–Barre syndrome (GBS). 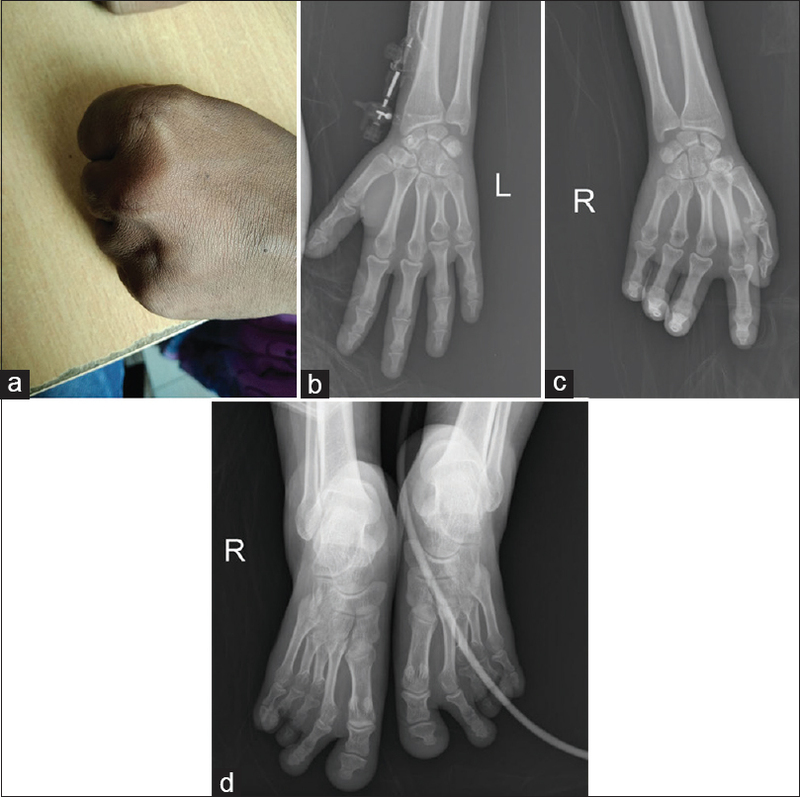 Materials and Methods: Ninety consecutive patients (age more than 12 years) with GBS admitted to a tertiary care center in southern India were included in this study. Data on clinical manifestations, nerve conduction studies, and response to therapy were collected. 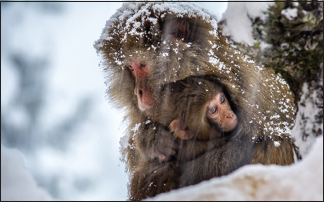 The following tests were done in stored serum samples – anti-ZIKV (IgM) antibodies, anti-C. jejuni (IgG) antibodies, and anti-ganglioside antibodies (IgG). Those samples which were positive to anti-Zika antibodies were tested for conventional polymerase chain reaction for ZIKV and IgM antibodies against dengue, and Japanese encephalitis virus. Results: Of the 90 patients, 3 died and 8 had persistent weakness. Acute inflammatory demyelinating polyradiculoneuropathy was the most common type of GBS (56.7%). Anti-ganglioside antibodies were present in 62.2% patients with GT1b being the most common. Anti-C. jejuni antibodies were present in 46.6%. Anti-Zika antibodies (IgM) were present in 14 patients (15.5%). Four of these patients also had anti-dengue antibody (IgM) positivity. Conclusion: This is one of the largest studies on GBS from India and the first one to report on the presence of Zika virus antibodies from this geographical area. Our study had a high prevalence of anti-C. jejuni and anti-ganglioside antibodies. 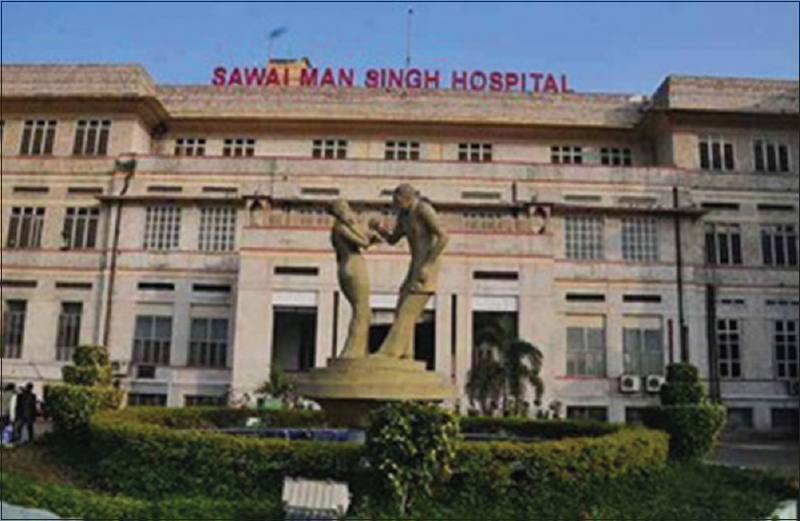 Evidence of recent ZIKV infection, as evidenced by anti-IgM antibodies, was present in 14 patients, with 4 of them being tested positive for anti-dengue IgM antibody. Whether this represents cross-reaction with dengue or prior/co-infection with dengue virus could not be addressed in this study. Background: Opsoclonus-myoclonus-ataxia syndrome (OMAS) is a rare disorder; there is limited experience regarding its clinical course and therapeutic response. Aims and Objectives: To describe the clinical profile, investigations, and therapeutic outcome in pediatric OMAS. Patients and Methods: Fourteen children (age: 27.1 ± 7 months; male: female = 1:2.3) suffering from OMAS seen over a period of 10 years (2006–2015) were included in the study. Their clinicodemographic profile, investigations, therapeutic outcome at follow-up, and relapses were reviewed. Results: Ten children reported antecedent events (respiratory infection: 7; gastrointestinal infection: 1; vaccination: 2). The most common referral diagnosis was acute cerebellitis (n = 8). Hypotonia (n = 9), abnormal behavior (n = 10), and neuroregression (n = 6) were also the frequent manifestations. 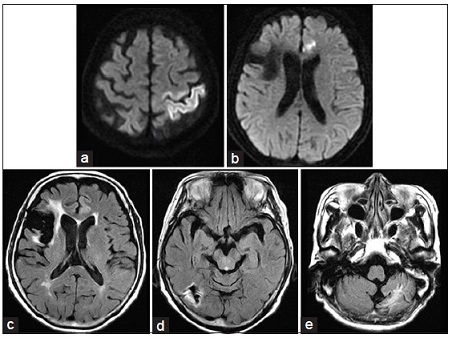 Brain magnetic resonance imaging, cerebrospinal fluid, and urinary vanillylmandelic acid were normal in all the patients. 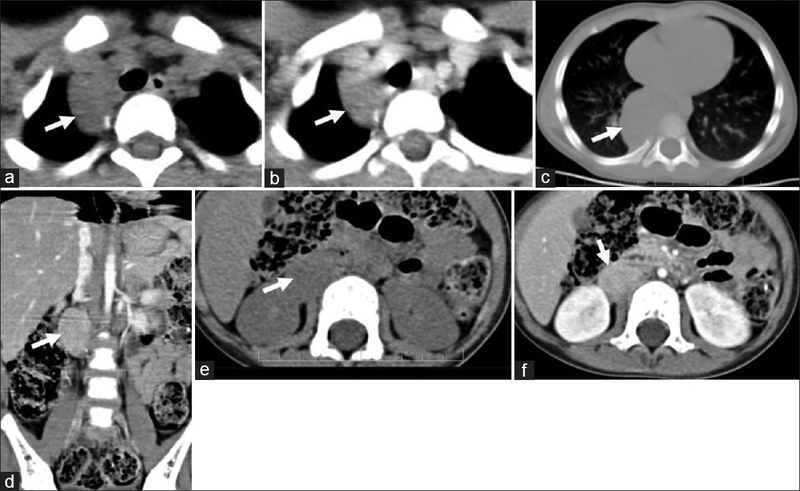 Seven patients had an underlying tumor (abdomen: 4; thorax: 2; neck: 1) detected by ultrasound (n = 2/14), computed tomography (CT) (n = 6/12), and fluorodeoxyglucose - positron emission tomography (n = 2/2). CT scan identified the tumor in 2 patients where metaiodobenzylguanidine scintigraphy was negative. All patients received steroids for 22.3 ± 20 months (3 months to 5 years). Eight required prolonged immunomodulation (>12 months). Complete remission after follow-up of 31.3 ± 19 months (7 months to 5 years) was noted in 5 patients, whereas the rest had persisting behavioral and cognitive abnormalities. Relapses were noted in 6 patients related to intercurrent infections (n = 5) and discontinuation of steroids (n = 1). The patients presented with isolated symptoms of the full-blown syndrome during their relapses. Conclusion: OMAS in children runs an indolent course requiring careful monitoring and long-term immunomodulation. An abnormal behavior is common and the outcome is variable. Background: The choice of fluid is important in neurosurgical patients, who may be dehydrated due to the administration of diuretics in order to reduce cerebral edema. Normal saline, the infused fluid routinely used in neurosurgical patients, can cause hyperchloremic metabolic acidosis. A balanced crystalloid (BC) may help to maintain the metabolic status more favorably in these patients, without adversely affecting brain relaxation. Methods: We conducted a prospective, randomized controlled trial on patients undergoing elective craniotomy for supratentorial tumor resection under general anesthesia. 44 patients were randomly allocated into two groups of 22 each to receive either normal saline or BC (Plasmalyte) as the maintenance fluid, intra-operatively. The metabolic parameters and osmolality were measured at regular intervals. Brain relaxation score was assessed by the operating surgeon. The patients were monitored with serum neutrophil gelatinase-associated lipocalin (NGAL), blood urea and serum creatinine for assessing the degree of acute kidney injury. Results: The metabolic profile was better maintained with the BC. The brain relaxation score was comparable between the two groups. The postoperative NGAL, urea and creatinine values were significantly higher in the normal saline group compared to the BC group. Conclusion: The balanced crystalloid maintains metabolic status more favorably than normal saline in neurosurgical patients. Hyperchloremic metabolic acidosis, and the other problems which occur as a consequence of normal saline infusion may be circumvented by choosing a balanced crystalloid electrolyte solution. Neither of the crystalloids appeared to have any adverse effect on brain relaxation. Background: Stroke is one of the common causes of chronic disability among neurological disorders. The role of various physiotherapy techniques has been extensively described in the literature. Here, we introduce a new physiotherapy technique, “Corrected-Assisted-Synchronized-Periodic (CASP) therapy.” In this study, we aimed to compare CASP therapy with conventional physiotherapies. 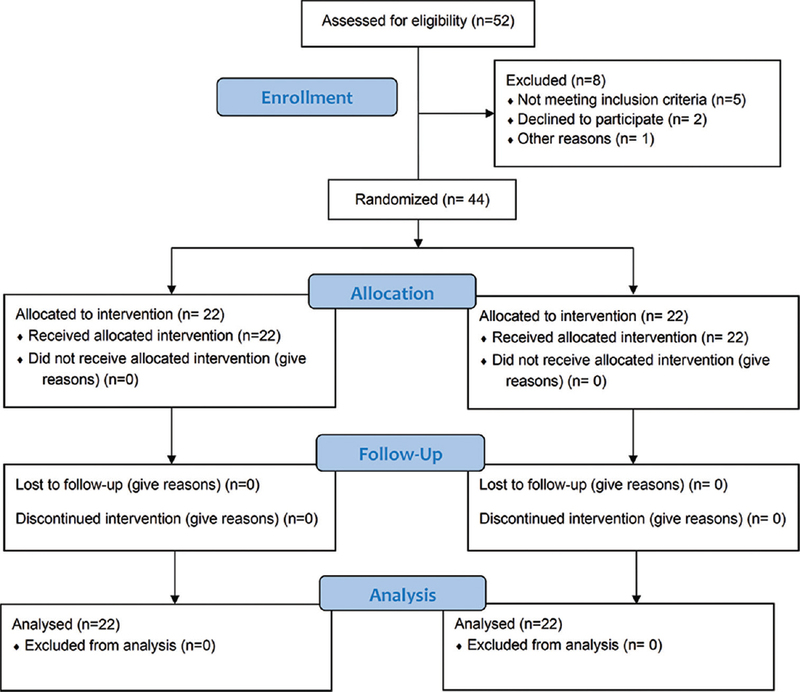 Materials and Methods: This was a prospective, parallel, quasi-randomized, double-blind controlled intervention trial. The study was carried out at a tertiary care teaching and research centre. Sixty-one stroke affected patients with functional modified Rankin Scale (mRS) ranging from 1 to 5 suffering from post-stroke spasticity (grade 1–4) and muscle weakness were included in the study. Patients were randomly allocated into two groups. The first group followed conventional passive stretching exercises and the second group was offered CASP therapy. They were prospectively followed up at 3 monthly intervals for 6 months. The main outcome-measures were improvement in power, reduction in spasticity, and improvement in overall functional outcome. Results: Mann–Whitney U-test for statistical significance was applied. At follow-up, CASP recipients reported improvement on functional scales such as Barthel index of activity of daily living, and modified Rankin scale (mRS), along with reduction in post-stroke spasticity and improvement in muscle power at 3 and 6 months of follow-up. Conclusion: CASP therapy has a major role in post-stroke rehabilitation particularly in limiting disability, reducing post-stroke spasticity, and providing an improvement in major functional outcomes. Purpose: Endocrinal insufficiency caused by vasculotoxic snake envenomation is under-recognized and is mostly confined to a specific geographic area. We conducted a prospective study to determine the prevalence and pattern of pituitary-target gland insufficiencies caused by snake envenomation. Materials and Methods: The hormonal evaluation of patients who had suffered from vasculotoxic snake envenomation was done at baseline and at 6 months of follow-up. Those patients with a documented hormonal insufficiency underwent magnetic resonance imaging (MRI) of the hypothalamo-pituitary area. The severity of envenomation was assessed by the acute physiology and chronic health evaluation II (APACHE-II) score, the sepsis-related organ failure assessment (SOFA) score, and the snake bite severity score (SBSS) for all patients. Results: Seventy-six patients were seen during the study period, of which 60 were available for a repeat hormonal evaluation at 6 months, with the majority of patients belonging to the middle age group (mean age, 37.6 ± 14.9 years). The mean lag period at presentation was 32 ± 20 h. Thirty-five patients (46.1%) had coagulopathy, 20 patients (26.3%) had acute kidney injury (AKI), and 8 of 76 patients (10.5%) needed renal replacement therapy (RRT) in the form of hemodialysis. 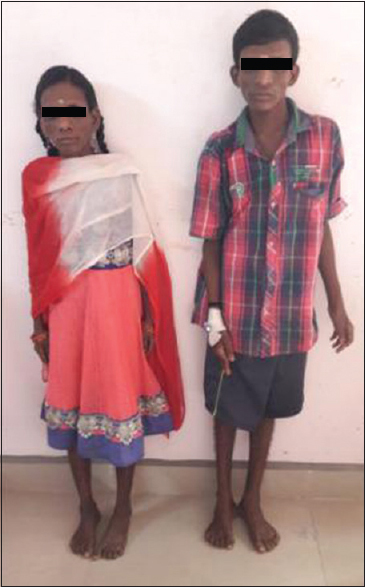 Six patients (out of 41 with vasculotoxic bites) developed chronic hypopituitarism, which was in continuation with the acute hypopituitarism that they developed. Growth hormone and glucocorticoid deficiencies were the most common endocrinopathies observed. The occurrence of hypopituitarism was observed only in patients with a vasculotoxic snake bite (due to Russell's viper); coagulopathy, renal insufficiency, or any of the scoring tools did not predict the occurrence of hypopituitarism. 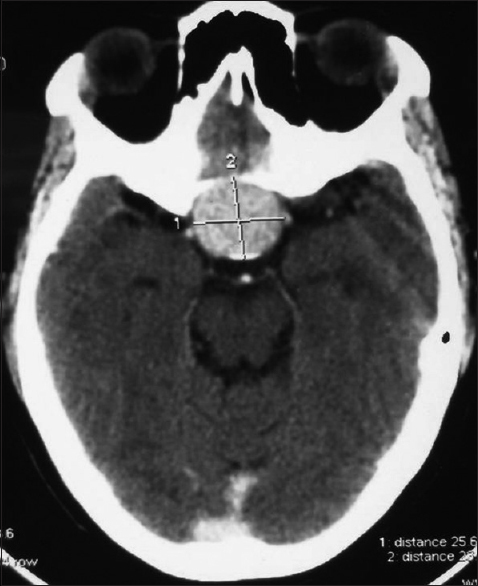 Conclusion: Acute asymptomatic and chronic symptomatic or asymptomatic hypopituitarism are important sequelae of viper bite in a small proportion of patients and can occur in the presence of normal pituitary imaging. 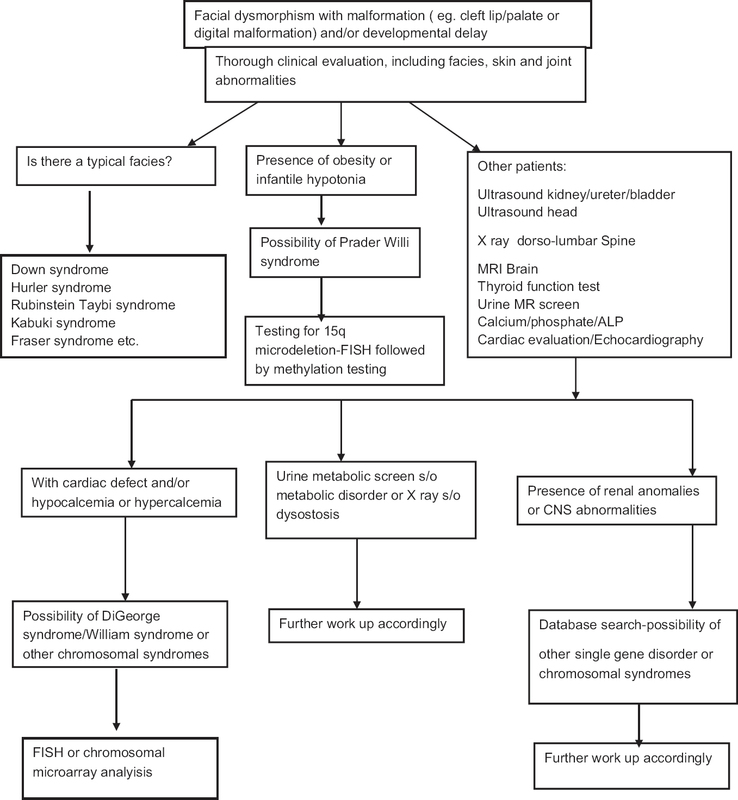 Routine prospective pituitary hormone screening should be done in all patients within the first 6 months of envenomation by the vasculotoxic snakebite as chronic pituitary dysfunction can often occur in these patients. Aim: To determine the characteristics of brain development in children with nocturnal enuresis, we investigated the intensity of functional connectivity both among the nodes in the brain network and between the two hemispheres of the brain. 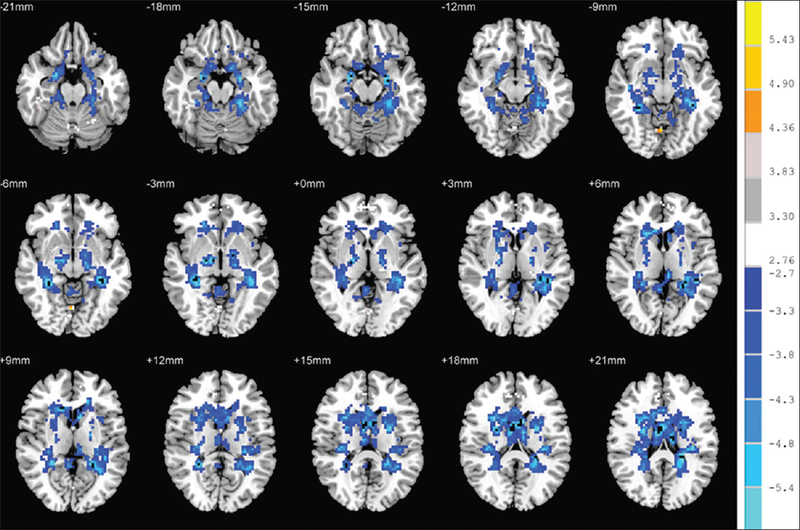 Materials and Methods: Twenty-three children with nocturnal enuresis (NE) and an equal number of normal children were examined using resting-state functional magnetic resonance imaging (fMRI) scans. Data analysis was done via the degree centrality (DC) and voxel-mirrored homotopic connectivity (VMHC) approaches. Moreover, we compared the children's psychological status by utilizing the self-concept scale. Results: In four areas of the brain, the the DC values of the NE group were obviously lower than that of the normal controls. These four areas were the posterior cerebellar lobe, anterior cingulate cortex (ACC), medial frontal gyrus, and superior left temporal gyrus (P < 0.05, after correction). We also found two brain areas where the VMHC values of the NE group were obviously lower than that of the normal controls. The two groups were the cerebellar lobe and the anterior cingulate cortex (ACC) [P < 0.05, after correction]. A psychological comparison between the children with NE and that in the normal group on the self-concept scale was also performed. The scores of the children with NE were lower than normal controls regarding behavior, appearance and property, anxiety, gregariousness, happiness, and satisfaction (P < 0.05). Conclusions: These findings provide evidence of the deficit of urination control in children with NE. Furthermore, through the methods of DC and VMHC, which are based on functional connectivity, it was also possible to explain why children with NE often have the concomitant symptoms of attention, control, and memory problems. The analysis of the self-concept scale suggests that children with NE lack self-confidence. Background: A retrospective analysis using chromosomal microarray in syndromic patients with intellectual disability from genetic clinics of a tertiary healthcare center in India was conducted. Aim: To identify the spectrum of chromosomal abnormalities detected on microarray analysis. Settings and Design: Cases were identified among those with intellectual disability with dysmorphism attending genetic clinics of a tertiary care center. Patients and Methods: All patients attending genetic clinics over a 3-year period were analyzed. Clinical profile and baseline investigations were noted on a predesigned proforma. Among the 65 studied cases, there were 12 cases suggested to be having Prader–Willi syndrome (PWS), 27 cases with DiGeorge/velocardiofacial syndrome (DGS), and 1 case with Williams–Beuren syndrome (WBS). These were detected by fluorescent in situ hybridization (FISH) analysis with specific probes and were excluded from the final analysis. Chromosomal microarray analysis (CMA; single-nucleotide polymorphism-based array-comparative genomic hybridization) was performed as per the clinical indication in selected patients with dysmorphism, microcephaly, mental retardation, and/or multiple malformations. These patients had a negative result on FISH analysis. Results: In suspected patients with PWS, FISH and methylation testing confirmed six cases to be really PWS. FISH also detected five cases of DGS and one case of WBS. These were excluded from the final analysis. Among the 18 cases tested by CMA, in 13 patients, abnormalities with potential clinical significance were identified. Genetic counseling was done in all these cases. Prenatal diagnosis was done in one family. Conclusion: In cases with dysmorphism with or without mental retardation or cardiac defect, advanced studies such as CMA can lead to a definitive diagnosis. Genetic counseling is mandatory in all these cases and a prenatal diagnosis is also feasible in selected families. Introduction: The Babinski sign is one of the most important clinical signs for detecting corticospinal tract (CST) lesions. However, due to variations in testing and interpretation, it has been associated with low interobserver agreement rates. In this study, the diagnostic value of finger and foot tapping in detecting CST lesions was compared to that of the Babinski sign. Materials and Methods: Three groups of participants were recruited: Group 1 – individuals having CST lesions diagnosed on the basis of clinical examination as well as neuroimaging; group 2 – individuals having a non-CST neurological illness; group 3 – normal individuals who were relatives of the patients recruited. 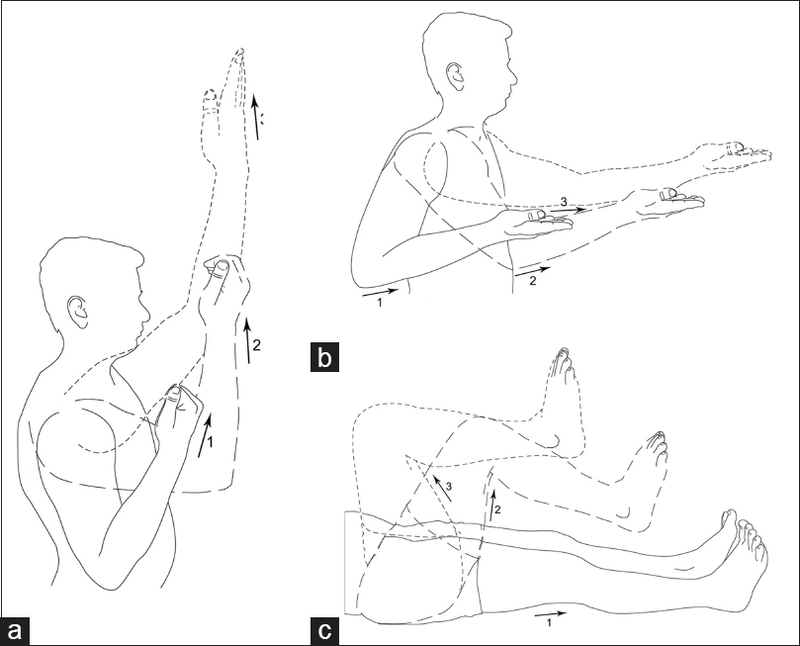 The sensitivity and specificity of finger tapping, foot tapping, and Babinski sign were calculated. Results: 375 patients, 125 in each group, were included. The overall sensitivity for Babinski sign was 49.6% and specificity was 85.8%. The overall sensitivity for finger and foot tapping was 79.5% and specificity was 88.4%. The interobserver agreement between the medical students and the neurologist was greater for finger and foot tapping (Kappa = 0.83) when compared to Babinski sign (Kappa = 0.45). Conclusion: Finger and foot tapping is a valid and reliable test in the clinical diagnosis of corticospinal lesions. The reliability and validity of Babinski sign is variable and thus its ability to diagnose the manifestations of corticospinal lesions is less when compared to the finger and foot tapping test. 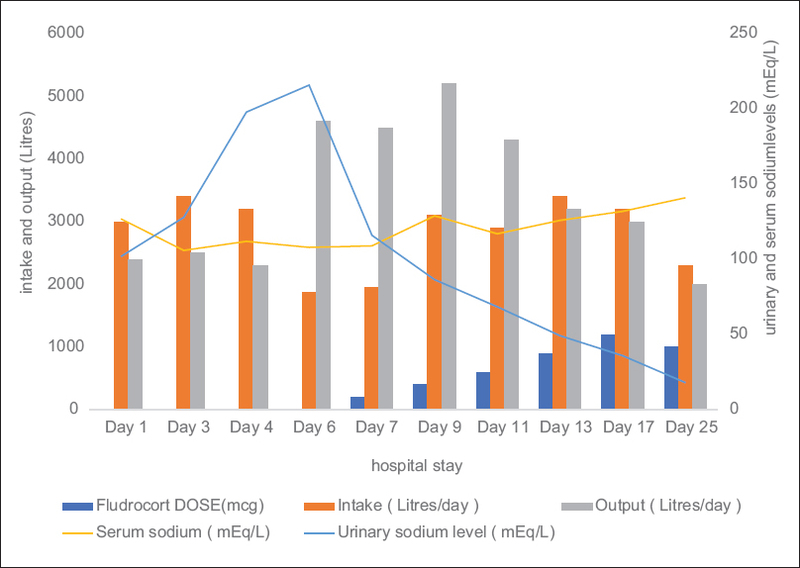 Objective: Post-operative hyponatremia (serum sodium <130 mEq/L) contributes to morbidity and prolongs the hospital stay of patients undergoing neurosurgical procedures. Syndrome of inappropriate anti-diuretic hormone secretion (SIADH) and cerebral salt wasting (CSW) commonly occur in the post-operative setting. While patients with SIADH are either euvolemic or hypervolemic, patients with CSW are always hypovolemic. The treatment of these two conditions is radically different. Patients with SIADH need fluid restriction, while patients with CSW need fluid replacement. As current diagnostic methods do not clearly distinguish between SIADH and CSW, we looked at N-terminal prohormone of brain natriuretic peptide (NT-proBNP) and uric acid as biochemical markers for estimating the volume status of patients developing hyponatremia in the postoperative period. Materials and Methods: In this study, we used a cohort design and carried it out in two phases over a period of 30 months (August 2011–February 2014). Thirty-one patients with hyponatremia were recruited into the study. In Phase1, 10 patients were diagnosed to have either SIADH or CSW based on their central venous pressure (CVP). In all of them, blood for NT-proBNP was collected prior to starting treatment. 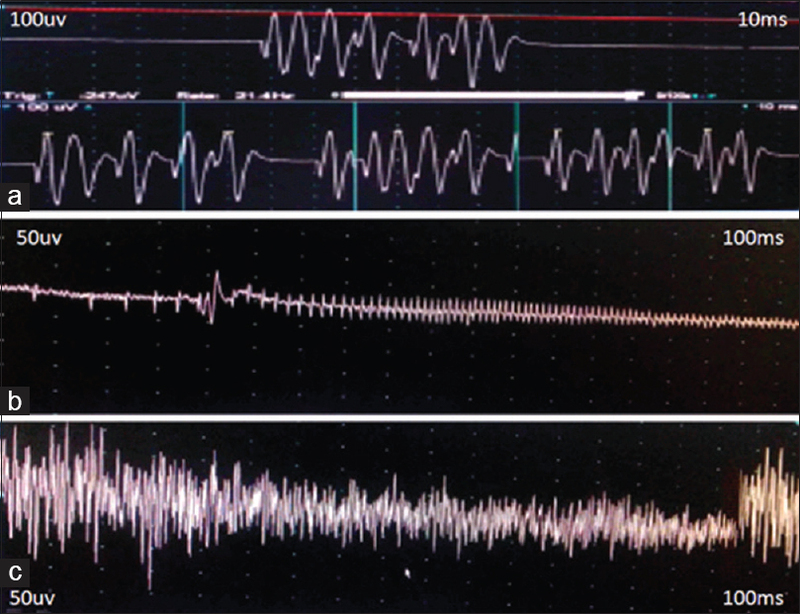 At a later stage, the NT-proBNP results were compared with central venous pressure (CVP) and the clinical diagnosis. Patients diagnosed to have SIADH (CVP >5cm) had NT-proBNP levels <125pg/ml and those with a diagnosis of CSW (CVP <5cm) had NT-proBNP levels >125pg/ml. In Phase2, 21 patients were categorized and treated according to their NT-proBNP levels. Those with NT-proBNP levels <125 pg/ml were treated as SIADH, and those with NT-proBNP levels >125 pg/ml were treated as CSW. Results: In Phase 1, NT-proBNP could detect hypovolemia in patients with CSW with 100% sensitivity and 66.7% specificity (P < 0.07). In Phase 2, NT-proBNP could detect hypovolemia in patients with CSW with 90% sensitivity and 100% specificity (P < 0.001). Combining the results of Phase 1 and Phase 2, NT-proBNP could diagnose CSW with 87.50% sensitivity and 93.33% specificity (P < 0.001). The positive predictive value was 93.33% and the negative predictive value was 87.50%. Conclusion: NT Pro-BNP is a quick and convenient assay to differentiate SIADH and CSW. We need a larger sample size to correctly characterize the cut off value. Uric acid cannot be used to distinguish between SIADH and CSW. Objective: Ossification of posterior longitudinal ligament (OPLL) is a progressive disease that causes spinal canal compromise and serious neurological sequelae in advanced cases. The incidence of OPLL in the Asiatic population is 2%–3%, but the incidence is more in the background of fluorosis. Our aim was to study the association of OPLL with fluorosis by comparing urine fluoride levels and to study the types of OPLL. 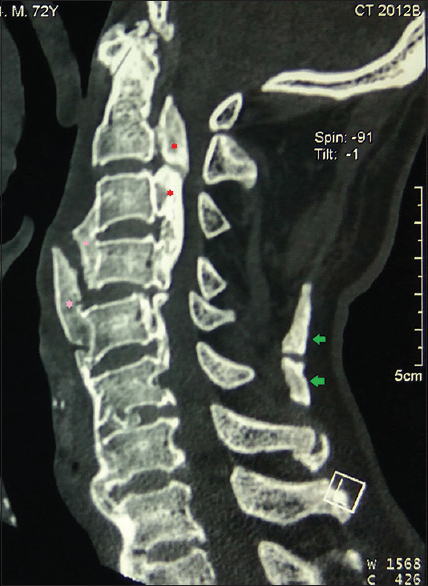 Materials and Methods: Thirty consecutive patients with OPLL, observed on cervical skiagram, and confirmed by the computed tomography (CT) of the cervical spine, underwent a 24-h urine fluoride level assessment by the ion-selective electrode method. Due consent of all the patients was obtained and the data was collected. Thirty patients with a normal cervical radiograph were taken as a control group and their 24-h urine fluoride levels were compared with the test group. The 24-h urine fluoride level above 1.6 mg/L was taken as the diagnostic parameter of fluorosis. Imaging analysis of the study group focused on the subtype of OPLL, the mass occupying ratio, the sagittal cervical angle, the signs of dural penetration, and the spinal levels involved. Urinary fluoride levels were correlated with the presence of OPLL and different types of OPLL. Results: Of the 30 patients with OPLL, 25 were males and 5 were females. The most common presentation was myelopathy. Continuous type of OPLL was seen in 11 (36.6%), segmental in 8 (26.6%), focal in 5 (16.6%), and mixed variant in 6 (20%) patients. 24-h urinary fluoride levels ranged from 0.26 mg/L to 12.2 mg/L. 18 (60%) of the patients in the study group were found to have urinary fluoride levels above 1.6 mg/L and only 1 patient (4%) of the control group had the urine fluoride level >1.6 mg/L. This difference was statistically significant. Patients with continuous and mixed types of OPLL had a higher mean urine fluoride level than those with a segmental and focal type of OPLL. The continuous variant of OPLL had a statistically significant occupancy ratio when compared to the other three variants, and the high mass occupancy ratio of the OPLL was directly associated with the presence of dural penetration. Conclusion: Fluorosis is associated with a higher incidence of OPLL. Higher urinary fluoride levels correlate with the severe forms of OPLL. Objectives: To compare the change in peak cerebrospinal (CSF) flow velocity at the cerebral aqueduct in patients with normal pressure hydrocephalus (NPH) before and after CSF tapping with clinical outcome of the patients, i.e., gait improvement. Materials and Methods: Forty patients with NPH were evaluated before and after CSF tapping on 3 consecutive days at our institution. Gait improvement was compared with the average peak velocity at the cerebral aqueduct. The average peak velocity was also compared before and after lumbar CSF tapping using phase contrast magnetic resonance imaging (PC-MRI). The different flow parameters were compared using paired t-test Results: The average peak velocity before and after lumbar CSF tapping was 5.8196 ± 1.420 cm/s and 4.1411 ± 1.0638 cm/s, respectively. The peak positive, negative, and average velocity decreased in the post-tap group. In our study, 70% of the patients showed gait improvement, and a comparison of the gait improvement with the change in average peak velocity was statistically significant (P = 0.001). Comparison of the change in peak positive and negative velocity with gait improvement was also statistically significant, with a P value of 0.004 and <0.001, respectively. Rest of the CSF flow parameters were statistically insignificant. Conclusion: PC-MRI is a sensitive method to support the diagnosis of NPH. Different flow parameters were comparable before and after CSF tapping. The parameters which might be useful for assessing clinical improvement include a change in the peak average, as well as positive, and negative velocity. Spindle cell oncocytoma (SCO) is a newly described rare entity simulating clinicoradiological features of a nonfunctional pituitary adenoma and is corresponding to the category of World Health Organization grade I tumor. However, because of the reported incidence of recurrence and invasive presentation in some cases, its categorization as a low grade tumor is questionable. Earlier, it was thought to arise from the folliculostellate cells of adenohypophysis. Recently, few reports have described expression of thyroid transcription factor-1 [TTF-1], which is a specific marker for pituicytes of neurohypophysis, suggesting this tumor to be a variant of pituicytoma. 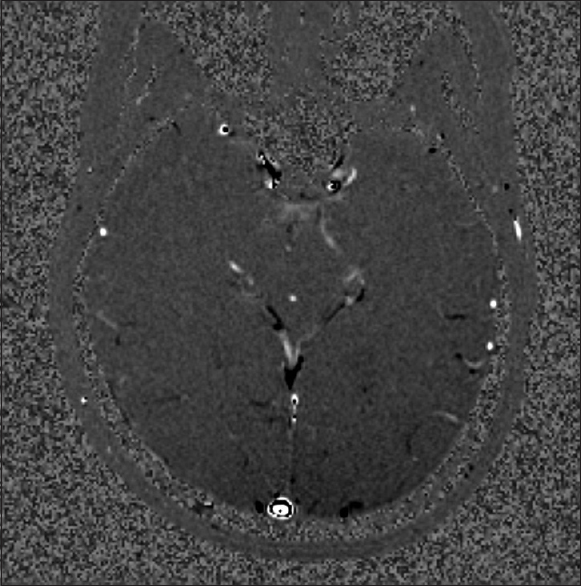 We describe a case of SCO in a 28-year-old young female patient with TTF-1 immunopositivity, and ultra-structurally showing abundant mitochondria along with few neurosecretory granules. 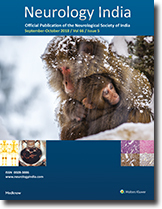 Background: The 2016 central nervous system (CNS) World Health Organisation (WHO) Update has merged the entities of meningeal solitary fibrous tumor (SFT) and hemangiopericytoma (HPC) into a single entity based on the presence of the nerve growth factor 1A (NGFI-A) binding protein 2 (NAB2)- signal transducer and activator of transcription 6 (STAT6) gene fusion in these tumors. Immunohistochemical (IHC) staining with STAT6 results in a strong nuclear positivity confirming the diagnosis. Meningeal SFT/HPCs are currently histologically graded according to a three-tiered system. Grade I (SFT phenotype) is benign, whereas grades II and III (HPC phenotype) are malignant and require radiotherapy in addition to gross total resection. Objectives: The objectives were to review the cases diagnosed as meningeal SFT or HPC between 2010 and 2017 and classify them into SFT (grade I) or HPC (grades II and III) phenotypes; to confirm the diagnosis by performing STAT6 immunohistochemistry; and to observe and record the histological features in detail and correlate the tumor grades with their behavior. The published literature on the subject was also reviewed. Materials and Methods: A total of 21 cases diagnosed between 2010 and 2017 as meningeal SFT or HPC were included in the study. All cases were reviewed by the authors and were categorized and graded according to histologic phenotype and mitotic count. STAT6 immunohistochemistry was performed in all the cases. The epidemiological data and histologic findings in each case were recorded in detail. The follow-up of patients was obtained. Results: Fifteen patients were males and six were females. The mean age was 43.5 years. The mean tumor size was 6.8 cm. The tumor specimens in 20 out of 21 cases corresponded to the HPC phenotype, of which 6 were in grade II while 14 were in grade III. 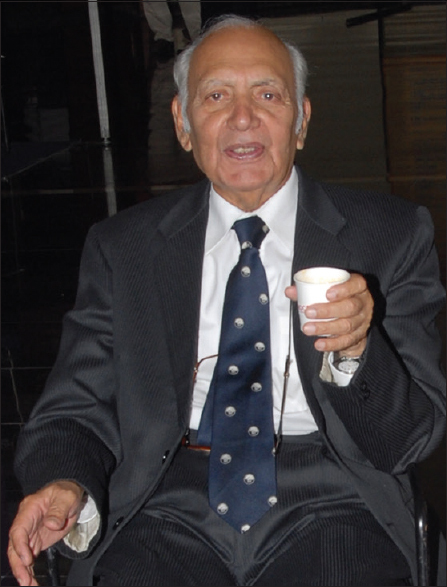 Thus, over 95% cases had malignant lesions. The tumor in all the 21 cases recruited for the study showed immunohistochemical positivity for SAT6, while CD34 was positive in all the 18 tumor in which it was performed. The follow-up was available in 14 of the patients. Recurrence occurred in six patients who had either a grade II or a grade III tumor and three patients died (including one patient with a grade III tumor. 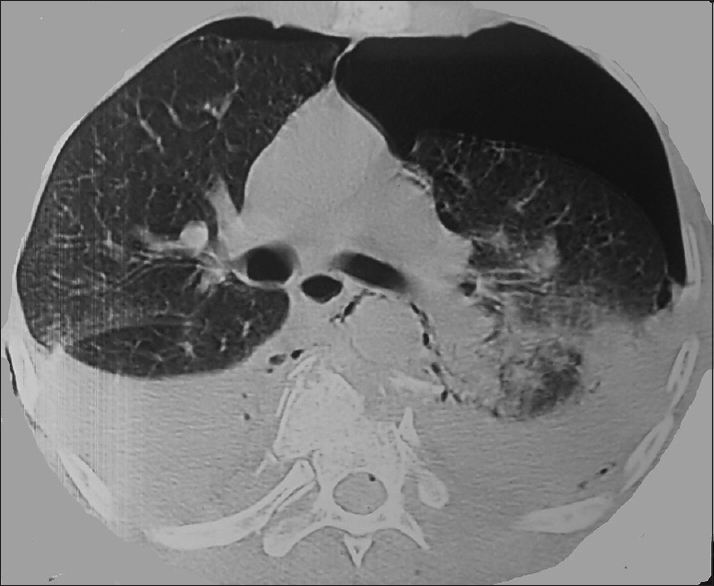 This patient died a month after initial resection although there was no evidence of recurrence). Radiotherapy was given to only 4 out of 14 patients in whom follow-up was available. Conclusion: These rare tumors need to be accurately diagnosed and optimally treated (gross total resection and radiotherapy) to improve the prognosis. Context: This study investigated the cost variation among neuropsychiatric drugs prevalent in the Indian market with reference to the National List of Essential Medicines (NLEM, 2015). Aims: To promote the rational use of medicines through cost variation analysis among drugs for neuropsychiatric disorders enlisted in NLEM and those not included in NLEM (NNLEM). Study Design: This study included drugs used for epilepsy, migraine, psychosis, depression, generalized anxiety disorder (GAD), bipolar disorder, and obsessive-compulsive disorder (OCD). Materials and Methods: The unit drug cost for the selected strengths of different manufacturers mentioned in the Current Index of Medical Specialities 2016 was used for calculating cost/defined daily dose (DDD). Statistical Analysis: Comparison was done among individual drugs and groups (NLEM and NNLEM) by cost/DDD in terms of interquartile range, percentage cost variation, and cost ratio. Results: The cost variation is wide for neuropsychiatric drugs (maximum, 1724.3% for risperidone in NLEM, and 1780% for olanzapine in NNLEM). The drug-to-cost ratio is the highest (168.8 times) for bipolar disorder and the lowest (9.7 times) for GAD. 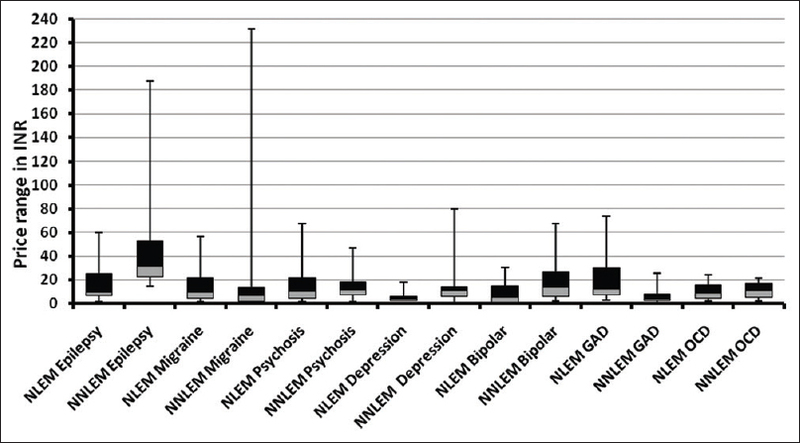 The NLEM drugs were found to be more economical than the NNLEM drugs among antiepileptic drugs, antidepressants, and drugs for bipolar disorder; however, the reverse was noted for antimigraine drugs and drugs for GAD. Antipsychotic medications and drugs for OCD in the NLEM group have a wider range than in the NNLEM group. Conclusions: The NLEM group has economical drugs in some disease categories; there is a need to consider the cost effectiveness of all drug categories while revising the NLEM next time and attention should focus on drug price regulation policies to accomplish the goal of rational use of medicines. 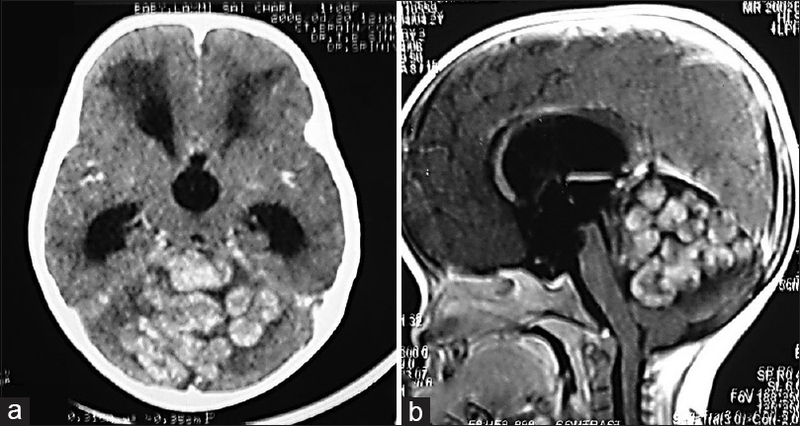 Introduction: Petroclival meningiomas are based on or arising from the petro-clival junction in upper two-thirds of clivus, medial to the fifth cranial nerve. This study focuses on the surgical experience in resecting large-giant tumors >3.5 in size predominantly utilizing middle fossa approaches. 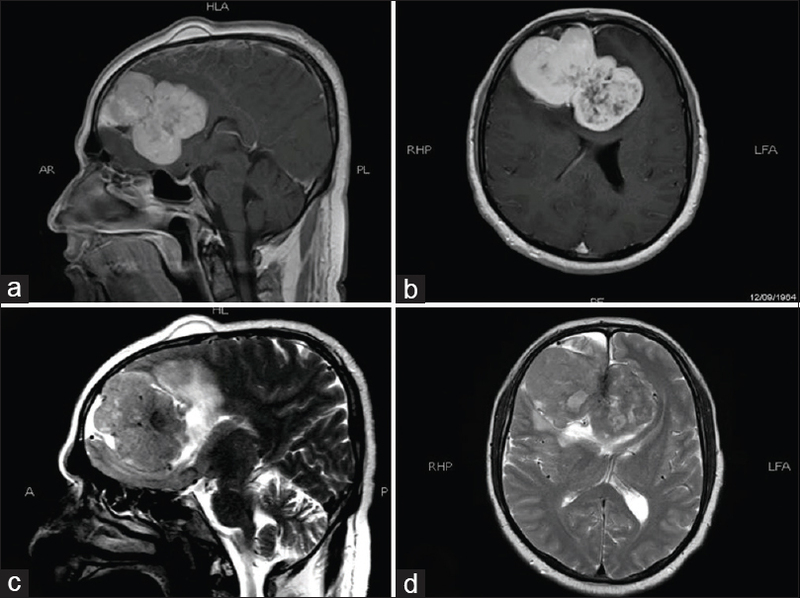 Material and Methods: 33 patients with a large or a giant petroclival meningioma (size >3.5 cm) were included. 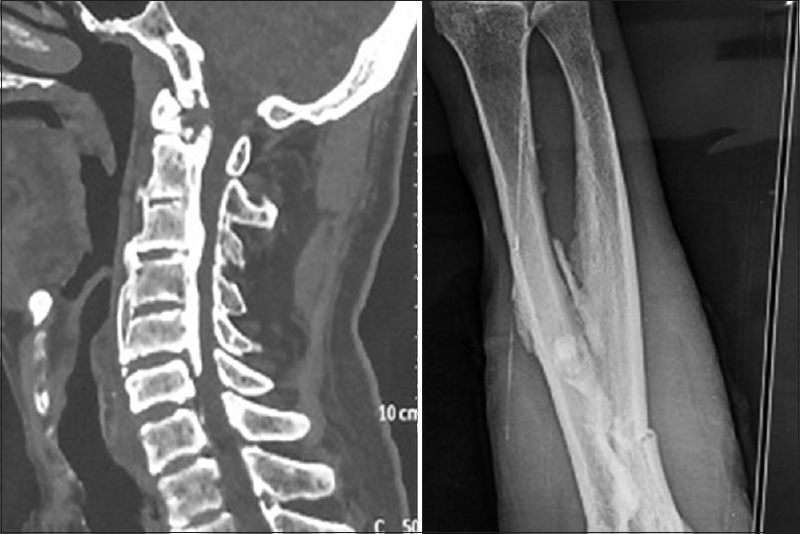 Clinical features, preoperative radiological details, operative findings, and postoperative clinical course at the follow-up visit were reviewed. Group A tumors (n = 17,51.5%) were sized 3.5cm-5cm, and Group B (n = 16,48.48%) tumors were of size >5 cm. Extent of resection was described as ‘gross total' (no residual tumor), ‘near total' (<10% residual tumor) and ‘subtotal resection' (>10% residual tumor). Glasgow outcome scale (GOS) quantitatively scored postoperative neurological outcome (mean follow up: 35.77months; range 1-106 months). Results: 25 (75.8%) patients had tumour extension into both supratentorial and infratentorial compartments. 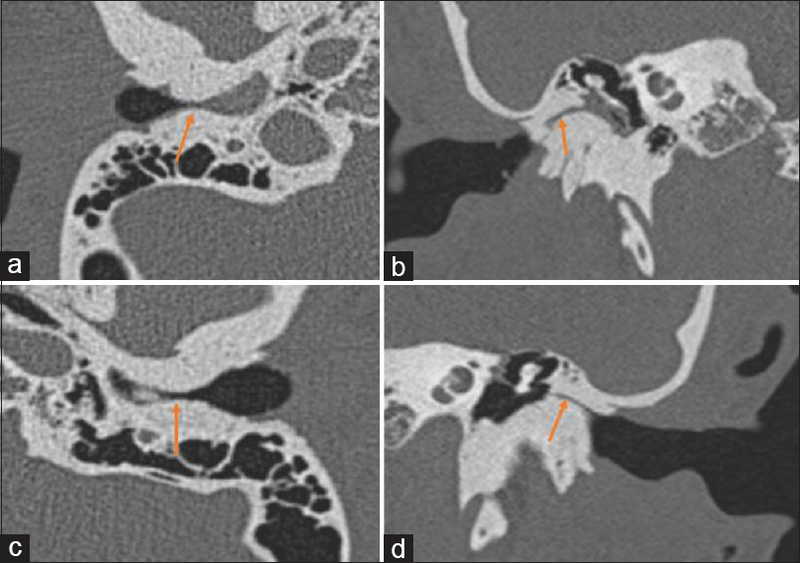 Extension into Meckel's cave (n = 25,75.8%), cavernous sinus (n = 17,48.4%], sphenoid sinus (n = 12,38.7%] and suprasellar area [12,38.7%] was often seen. In 31 (93.9%) patients, the tumor crossed the midline in the premedullary, prepontine, and interpeduncular cisterns. In 20 (60.6%) patients, the tumour extended below and posterior to the internal auditory meatus (IAM), while in 13 (39.4%) patients, the tumor was located above and anterior to the IAM. Kawase's approach was the most commonly used approach in 16 (48.48%) patients and resulted in maximum tumor resection. Other approaches included half-and-half (trans-Sylvian with subtemporal) [n = 6, 18.18%]; frontotemporal craniotomy with orbitozygomatic osteotomy [n = 1, 3%] and retromastoid suboccipital craniectomy (RMSO) [n = 7, 21.21%]. In 2 (6.06%) patients, staged anterior petrosectomy with RMSO; and, in 1, staged presigmoid with half-and-half approach was used. Gross total excision was achieved in 12 (36.36%), near-total excision in 15 (45.45%) and subtotal excision in 6 (18.18%) patients. 20 (60.6%) patients had a good functional outcome; 6 patients succumbed due to meningitis, pneumonitis, perforator injury or a large tumor recurrence. 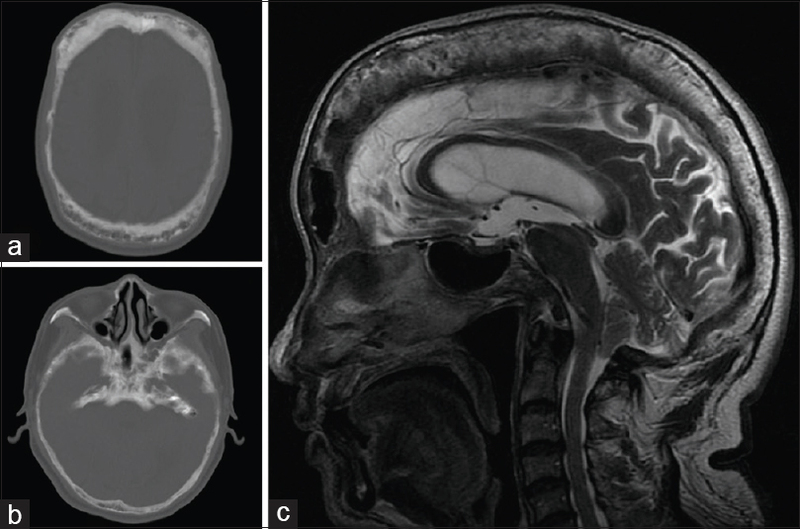 Conclusions: Half-and-half approach was used in tumors with middle and posterior cranial fossae components often extending to the suprasellar region. Kawase's anterior petrosectomy was utilized in resecting tumors with predominant posterior fossa component (along with a small middle fossa component) that was crossing the midline anterior to the brain stem, and mainly situated superomedial to the IAM. Tumors confined to the posterior fossa, that extended laterally and below the IAM were resected utilizing the RMSO approach. Occasionally, a combination of these approaches was used. Middle fossa approaches help in significantly avoiding morbidity by an early devascularisation and decompression of the tumor. In tumors lacking a plane of cleavage, a thin rim of capsule of tumor may be left to avoid brain stem signs. 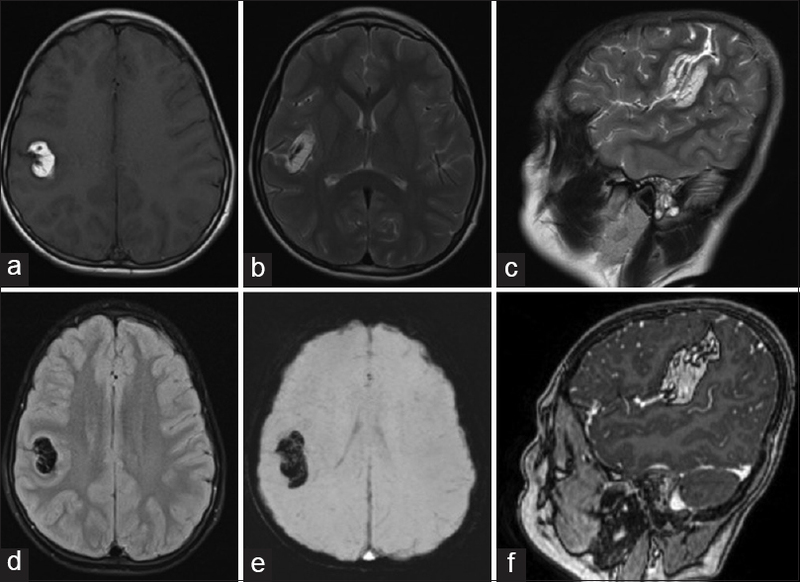 Objective: The aim of this study is to report the pattern, timing, responsible radiation parameters, and dosimetric results on the outcome of alopecia following gamma knife radiosurgery (GKRS) for various intracranial pathologies. A literature review of radiation-induced alopecia and observation of this complication with GKRS are also included. Materials and Methods: The authors report 6 cases of GKRS-induced focal temporary alopecia without dermal fibrosis or clinical scarring and with no long-term squeal. Results: In all the cases, the scalp received ≥3 Gy radiation exposure. Post GKRS alopecia is a temporary, noncicatricial, focal, reversible phenomenon observed within 2 weeks of the treatment. This acute complication is dose-dependent and reflects damage to the hair follicle. It is only seen with treated volumes in the superficial location. Hair regrowth occurs within two months with no long-term complications and change in hair quality being noted. Conclusion: Compared to whole brain radiotherapy, chances of alopecia are significantly less after GKRS. Despite a sharp dose fallout, a single fraction high-dose radiosurgery with GKRS may expose the skin appendages to more than 3 Gy radiation exposures, which may injure the hair follicles irrespective of the growth phase (anagen, telogen, or catagen) they are in. A careful planning that includes sparing of the dermal appendages and hair roots up to 4–6 mm depth in the skin may prevent this complication. 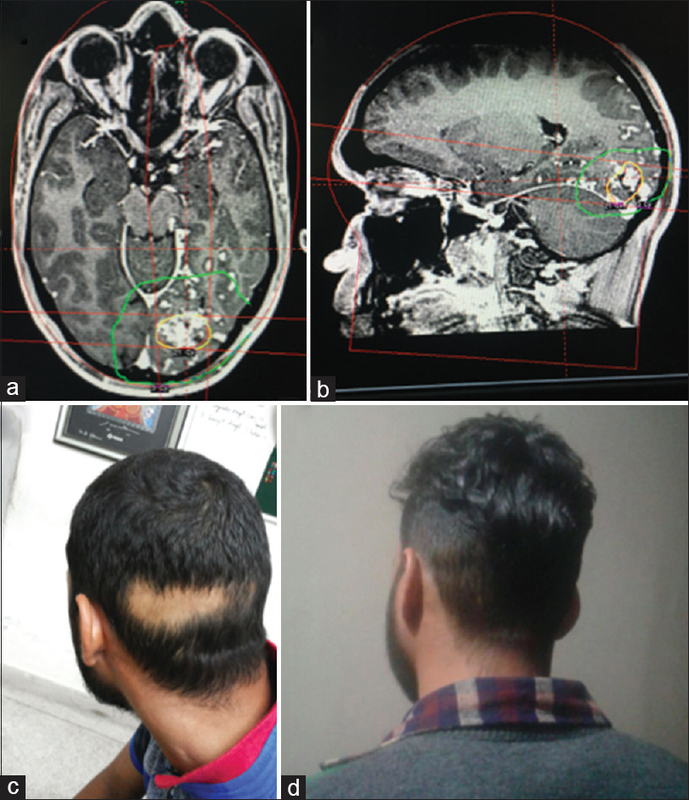 Patients with superficial lesions should be well informed about the reversible nature of this possible complication, with near-normal hair growth being established within 2 months of treatment.